1698: disciple of Tamagawa Sennojô III, he started his career in Kyôto, performing as a tachiyaku. 1st lunar month of 1705: Genzaburô became dôkegata and performed in Kyôto in the new year drama "Keisei Hachisu no Ito", which was staged at Kameya Kumenojô's theater. Fall 1709: Genzaburô went to Ôsaka. 11th lunar month of 1709: Genzaburô played in Ôsaka the role of Kotatsuya Tokubê in the kaomise drama "Chigo Daimyô Kyô Miyage", which was produced by Sakakiyama Shirotarô I. Fall 1710: Genzaburô went back to Kyôto. 11th lunar month of 1710: Genzaburô performed at Hoteiya Umenojô's theater in the kaomise drama "Tagasode Ume Sakura Matsu". 6th lunar month of 1713: Genzaburô went to Edo and performed at the Yamamuraza. He failed as humour was different depending on the city. He quickly went back to Kyôto. 1st lunar month of 1714: Genzaburô played the role of the Nô master Matsunoshin in the kaomise drama "Toshitokujin Midoribune", which was produced in Kyôto at Ebisuya Hatsudayû's theater by Mitsuyama Shichisaburô. Genzaburô's rank in the Kyôto hyôbanki, dôkegata section, was jô-jô-(hanshiro)kichi (superior - superior - almost excellent) [visual]. 11th lunar month of 1717: Genzaburô played in Kyôto the role of Sakan Genzô in Sadoshima Saburôzaemon's kaomise drama "Iwao no Matsu Manbai no Midori" , which is produced by Miyako Mandayû in his theater. 1st lunar month of 1718: Genzaburô's rank in the Kyôto hyôbanki, dôkegata section, was jô-jô-kichi  (superior - superior - excellent) [visual]. He shared the same rank with Yamada Jinpachi. 11th lunar month of 1718: Genzaburô played at Miyako Mandayû's theater the role of Dekinoshin in Sadoshima Saburôzaemon's kaomise drama "Meoto Matsu Jufuku no Kodane"; his stage partners were Mihogi Gizaemon I, Bandô Hikosaburô I, Kaneko Kichizaemon, Yamashita Kamenojô I, Miyazaki Giheita, Yamamoto Kamon, Hyakunin'isshu Genzaburô and Otowa Jirosaburô I. 1st lunar month of 1719: Genzaburô's rank in the Kyôto hyôbanki, dôkegata section, was jô-jô-(hanshiro)kichi (superior - superior - almost excellent) [visual]. 11th lunar month of 1719: Genzaburô played in Kyôto at Miyako Mandayû's theater the role of the sake maker Yajûbê in Sadoshima Saburôzaemon's kaomise drama "Shôjô Zakaya Mannen-gura". 1st lunar month of 1720: Genzaburô's rank in the Kyôto hyôbanki, dôkegata section, was jô-jô-kichi (superior - superior - excellent) [visual]. He shared the same rank with Yamada Jinpachi. 11th lunar month of 1720: Genzaburô played in Kyôto the role of the kagokaki Shinbê at Miyako Mandayû's theater in the kaomise drama "Gosha no Yonegura Fukki no Aimuko". 1st lunar month of 1721: Genzaburô's rank in the Kyôto hyôbanki, dôkegata section, was jô-jô-(hanshiro)kichi (superior - superior - almost excellent) [visual]. He shared the same rank with Matsushima Moheiji. 3rd lunar month of 1721: Genzaburô's rank in the Kyôto hyôbanki, dôkegata section, was jô-jô-kichi (superior - superior - excellent) [visual]. He shared the same rank with Yamada Jinpachi and Matsushima Moheiji. 11th lunar month of 1721: Genzaburô played in Kyôto at Miyako Mandayû's theater the role of Negi Kindayû in the kaomise drama "Inari Fuku In'yô no Kanegura", which was produced by Sawamura Chôjûrô I. 1st lunar month of 1722: Genzaburô's rank in the Kyôto hyôbanki, dôkegata section, was jô-jô-kichi (superior - superior - excellent) [visual]. 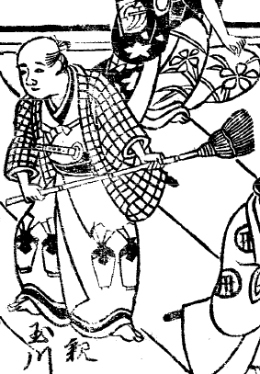 1st lunar month of 1723: Genzaburô was not recorded in the Kyôto hyôbanki. He played in Kyôto at Daikokuya Takenojô's theater the role of the servant Matasaku in the new year drama "Keisei Hitomaruzuka" which was produced by Otowa Jirosaburô I. 3rd lunar month of 1723: Genzaburô's rank in the Kyôto hyôbanki, dôkegata section, was jô-jô-kichi (superior - superior - excellent) [visual]. 11th lunar month of 1723: Genzaburô played in Kyôto the role of Kusuemon in the kaomise drama "Teono Hajime Kogane no Ishizue", which was produced by Segawa Kikunojô I. 3rd lunar month of 1724: Genzaburô's rank in the Kyôto hyôbanki, dôkegata section, was jô-jô-kichi  (superior - superior - excellent) [visual]. 1st lunar month of 1725: Genzaburô was not recorded in any hyôbanki . 1st/3rd lunar months of 1726: Genzaburô was not recorded in any hyôbanki . 11th lunar month of 1726: Genzaburô appeared on stage for the last time in Kyôto, where he played at Kameya Kumenojô's theater the role of Hanshichi in the kaomise drama "Karanishiki Imose no Shitone". 1st lunar month of 1727: Genzaburô's rank in the Kyôto hyôbanki, dôkegata section, was jô-jô-(shiro)kichi (superior - superior - (white) excellent) [visual]. No record afterwards. Tamagawa Genzaburô was a popular dôkegata actor, who was active mostly in Kyôto from the end of the 1690s to the second half of the 1720s. He tried to perform in Ôsaka or Edo, where he was not successful. In the Imperial City, he reached the prestigious jô-jô-kichi rank several times. He shared the stage with another dôkegata actor named Genzaburô. In a different hyôbanki published the same month, he was jô-jô-(hanshiro)kichi (superior - superior - almost excellent) [visual]. He had the same rank in the hyôbanki, which was published in the 3rd lunar month of 1724. Was he sick ? Was he in tabi shibai? Was he in miyaji shibai? We don't know.